In each battle, or duel, the players play cards to damage each others’ cars. When one side of a player’s car is breached (the armor on that side is destroyed), the car’s driver may be attacked! If a car’s driver is disabled and unable to operate his car, the player who disabled him scores a kill. (Note that the driver will be back for the next duel! Only the car is killed.) When only one car is left (or when time runs out), the duel is over. New duels continue until one player has scored 60 points to become an Ace! 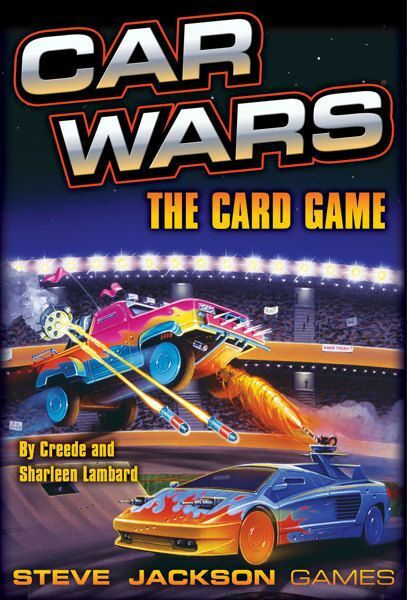 Car Wars: The Card Game is fully compatible with Battle Cattle: The Card Game! Combine the two… take your hot rod out to the pasture and go gunning for Bossy…but remember, Bossy shoots back!